Hello friends! 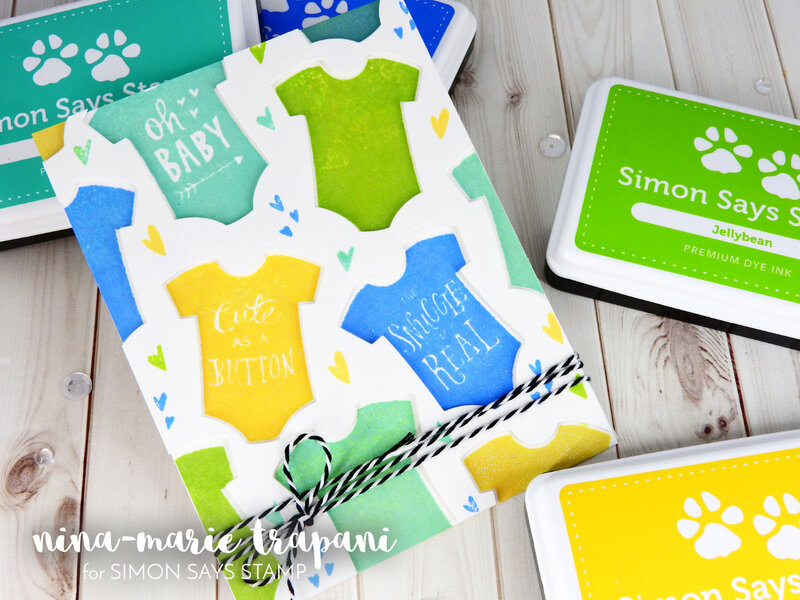 Welcome to my stop in the Simon Says Stamp Masterpiece Box Blog Hop! If you’ve already been hopping along with us, you should have arrive from one of my fabulous friends, May Sukyong Park! If you have just joined in the hop though, scroll down to the bottom of the post for the complete line-up of designers participating! If you haven’t heard of the Masterpiece Box and are wondering what I might be talking about, let me tell you a bit about this awesome collection! 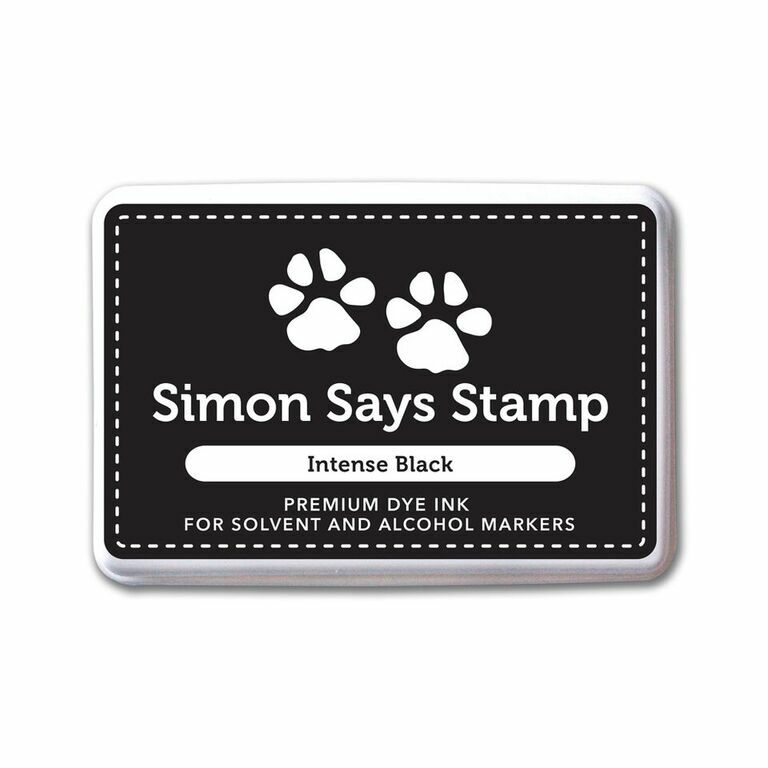 The Masterpieces box is a collection of new stamps, dies and inks from some of your favorite brands, including: Altenew, Clearly Besotted, Hero Arts, Lawn Fawn, Mama Elephant, Memory Box, Reverse Confetti, Tim Holtz, WPlus9… and of course, Simon Says Stamp! The box is available at limited quantities and once it is sold out, they won’t be restocking… so get yours quick!!! As a side note, one of the stamp sets included in the Masterpieces collection is the Tim Holtz Crazy Dogs set. For those of you who already preordered this set from Simon Says Stamp, you can cancel the preorder if you purchase the Masterpieces box. Okay! So now it’s time to check out what kind of awesome projects you can make with the Masterpiece Box! For my first card, I have used the Tim Holtz Crazy Dogs stamp set; aren’t the little pups in this set so much fun???? I love the expression on this particular one on my card… it makes me laugh! I did Copic coloring for the dog, and I used the following marker colors: E30, E53, E33, E57 (body); E57, E47, E77, W9 (nose and eye brows); R17, R35, Y21 (collar); BG0000 (eyes); W00, W1, W3, W5, W7 (ground). After coloring the dog, I fussy cut him out using fine tip scissors from CutterBee. My sentiment is created with two stamp sets included in the Masterpiece Box; Whimsy Alphas from Plus9 and Tiny Ninjas from Mama Elephant. I love how the fonts paired so well together from these two stamp sets! I stamped the sentiments with a combination of dye inks (Schoolhouse Red from Simon Says Stamp and Navy from Hero Arts). 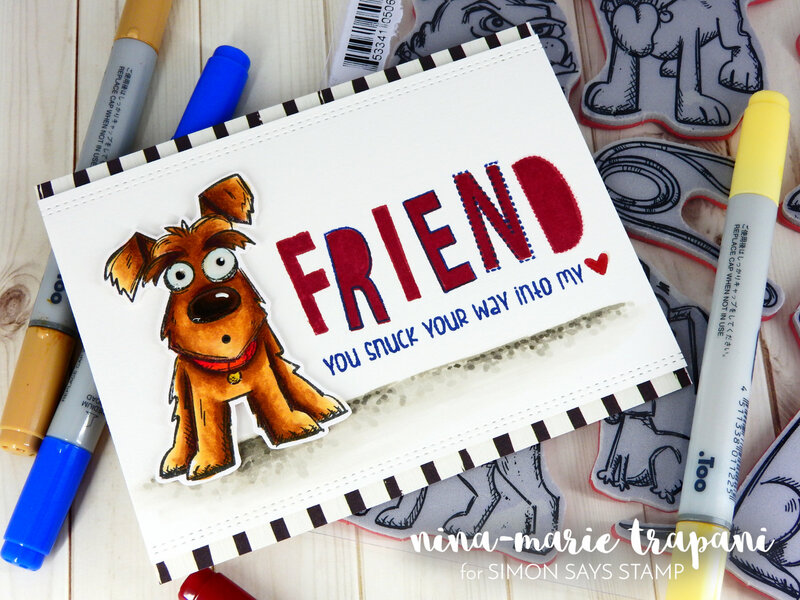 As a note: I didn’t stamp the word “heart” from the sentiment included in the Mama Elephant set, but rather stamped a small red heart from Simon’s Look for the Miracles stamp set; this was done simply to add a bit more fun to the design and be a bit different! Finally, I popped the dog up onto my card with foam tape and mounted the panel he is attached to onto a patterned paper-covered card base. I also added a bit of small embellishing details using a white gel pen for highlights and some Glossy Accents for a bit of shine. 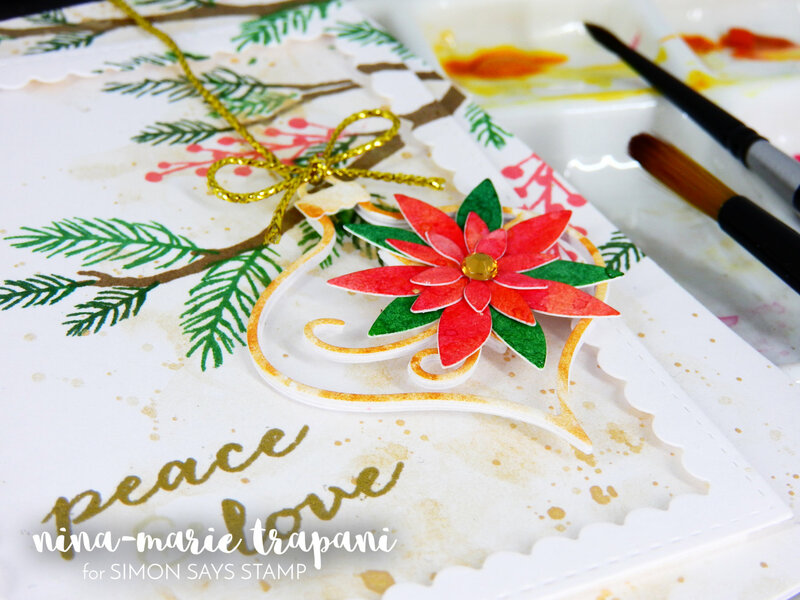 This next card I have features the gorgeous Hero Arts Cardinal Layering stamp set and Memory Box Fanciful Poinsettia Ornament die! While I didn’t use the cardinal in the Hero Arts color layering stamp set, I wanted to show how versatile the smaller, supporting elements of a stamp set can be! Here I started off by adding a wash of gold watercolors (along with some splatters!) using Finetec’s gold mica set; while I had the watercolors out, I also created a gold swatch on some watercolor paper which I later die cut my ornament from. 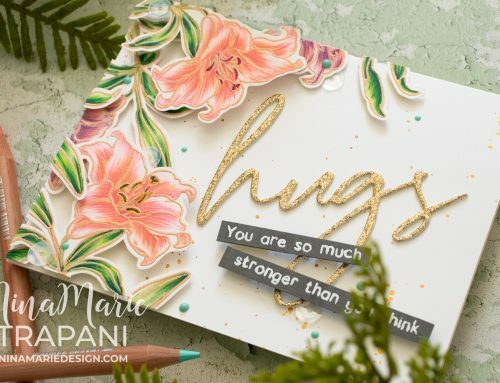 Once the watercolor background was finished, I started adding some stamped details onto my card with the Hero Arts Cardinal Layering stamp set. I temporarily adhered a scallop rectangle frame over my card base and stamped the branches, pine needles and berries onto the card using Hero Arts dye inks. The reason I applied the scalloped frame over the card base prior to stamping is because I wanted the stamping to overlap onto the frame (which was later adhered to the card base). Stamping on both the frame and the card base enabled the scene to be continued across the card instead of being broken up by a plain white frame. The sentiment is from the Hero Arts cardinal set, and I heat embossed it using gold embossing powder from Ranger (the “&” symbol is stamped in Fossil ink from Simon). Next came the building of the poinsettia ornament; as I mentioned above, I had watercolored a swatch of gold onto some watercolor paper to use as the coloring of my ornament. I also created two more watercolor swatches using green and red watercolors from Winsor and Newton. I then die cut all of these swatches using the Fanciful Poinsettia dies. To make the process more simpler, you could die cut from colored cardstocks instead, but I love the variegated look of the watercolor swatches! Once the pieces were die cut, I adhered them all together and added them to my card base along with some gold cord; the cord really helps this ornament come to life! For a final finishing touch, I adhered a small gold gem into the center of the poinsettia. 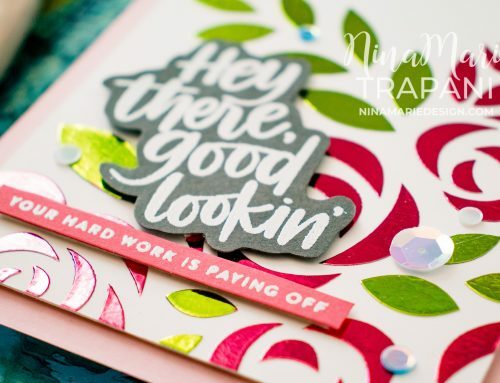 My final card that I have to share with you features the super cute Reverse Confetti Cute as a Button stamp and die set! 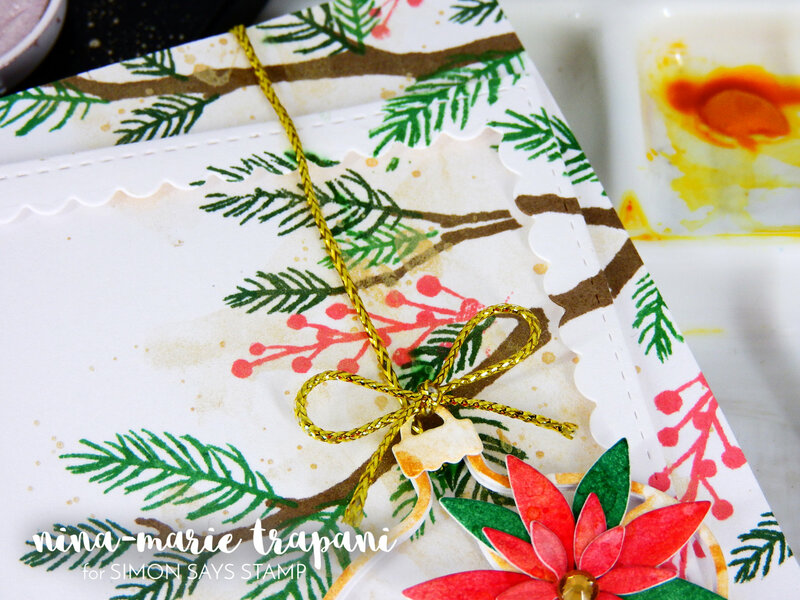 I used these two pieces to create a fun recessed background, AND I have a video to show you how I did it! 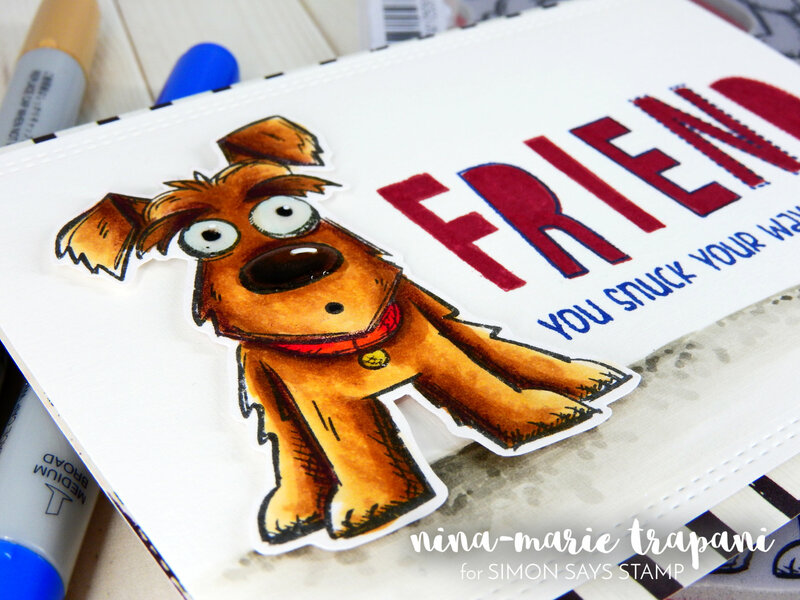 This is a really fun way to use your dies and stamps a bit differently and I hope that the video inspires you to try it yourself! In the video, I’ll also give you a closer look at the stamp sets used to create the other cards I am sharing today! If you enjoy, please give the video a thumbs up and subscribe to my channel for more weekly inspiration! 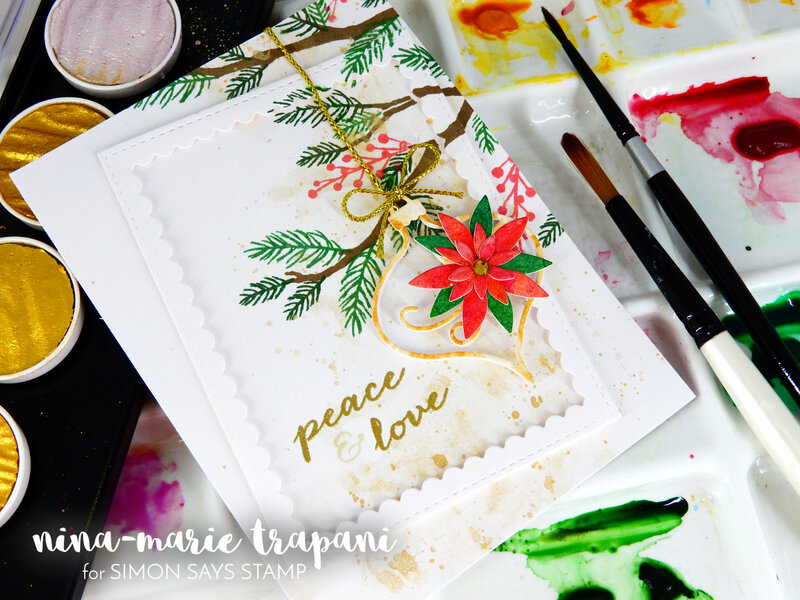 Head on over to Simon Says Stamp to get a Masterpieces box of your very own! 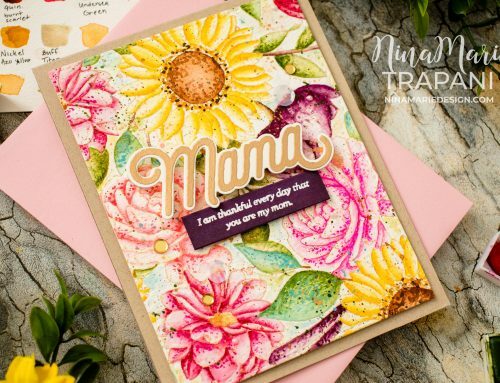 But don’t wait long, supplies are limited and once they are gone, you’ll have to wait until later this year to get these fabulous stamp and die sets! There is lot’s more inspiration to be seen along the hop! 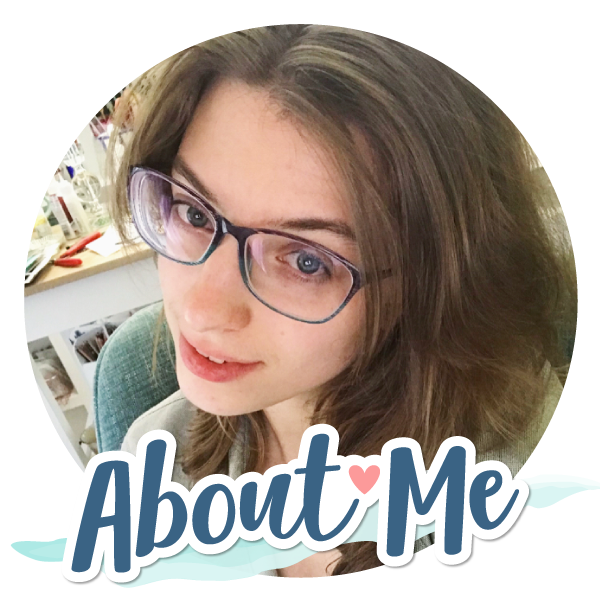 Your next stop is the creatively awesome Heather Ruwe… I know she’s bound to have something super clever on her blog to share with you! 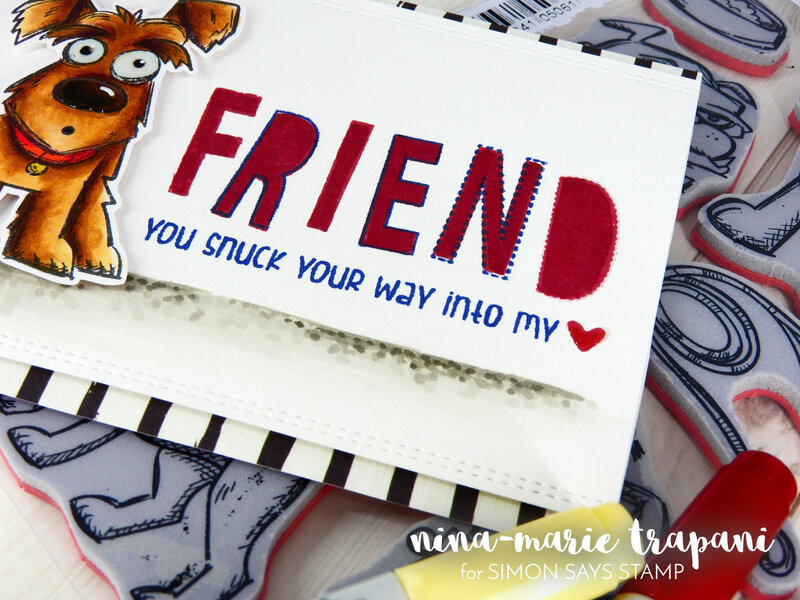 PLUS, make sure you leave a comment on this post and on all the other stops in the hop, as each blog has a $25 Simon Says Stamp gift certificate up for grabs! All winners will be drawn and announced on Monday, July 18th on the Simon blog. Totally cute baby card and your puppy is adorable. Thanks. 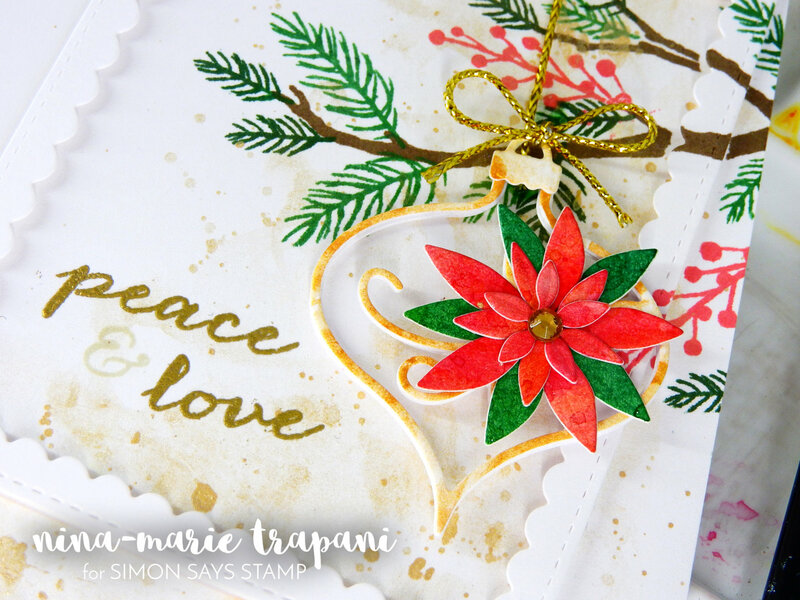 the poinsettia ornament die is definitely on my wish list and your pup looks almost 3D; thanx for the inspiration and blog candy opp! I love all of your cards! They are so colorful! I love that Christmas one but how do you mail that? I would guess you would have to put it in a special envelope so the front doesn’t get ruined in the mail. Everyone on this hop made such nice cards. I am laid up with a broken foot so it’s nice to see some beautiful art to make me smile. I have been smiling ever since. Those onesies are gorgeous, such a cute way to use them too! Wow! So many great ideas and beautiful cards! Thanks for sharing! Fun mix of stamps in this new box collection. Your cards are sweet! Such an eclectic mix of fun cards. thanks for sharing! Awww so pretty, sweet and cute! Love them all! So pretty. so adorable, and just fabulous!!!! These are stunning cards, Nina. Love them! My favorite is your card with the branches and the ornament. Such different styles on all 3 cards and all fabulous! Thanks for sharing how you did the recessed background – it looks great!